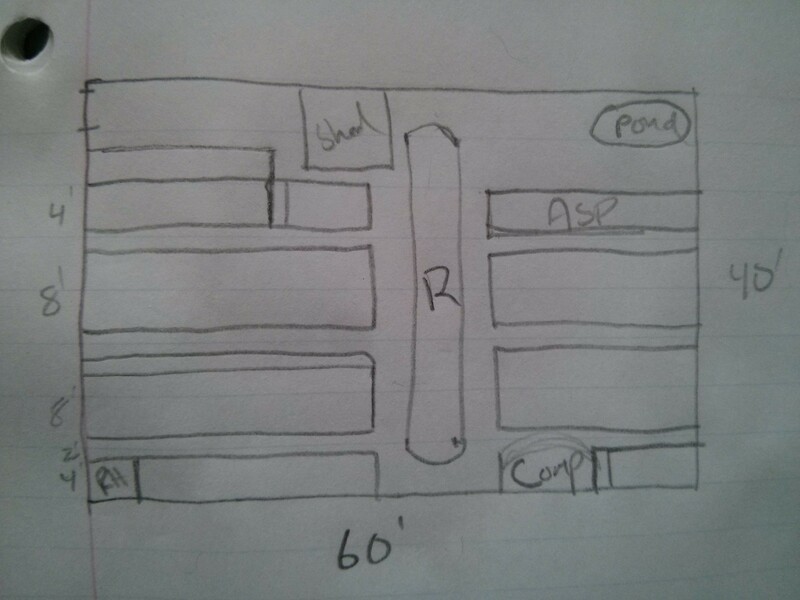 I planned a new layout for the garden that Ethan and I will implement in the coming years. That’s not a typo. It will probably take us years to get the garden where I want it. I expect that by Winter we’ll have one new bed prepared and the three existing beds can be enriched enough so that next Spring we can use all four for planting. 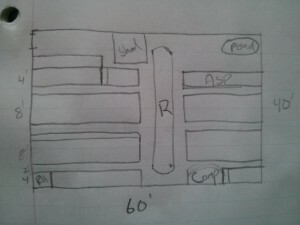 A rough sketch of my plan for the garden. The first step to preparing a new bed is to eliminate the existing weeds, and step two is amending the soil enough so something will thrive rather than survive. After some research I determined that the simplest, chemical-free way to eliminate a bunch of weeds is to put down clear plastic over it and bury the edges of the plastic. This basically creates a mini greenhouse that gets stifling hot. After a couple of weeks in the heat of summer most or all of the weeds should be dead. On Friday we went into the garden to pull up the grass growing through the fence that would make it challenging to put down and bury the plastic and discovered that the weed block the previous owners put down was finally going to help us. They laid this fabric in wide paths around the garden and covered those paths with a thick layer of wood chips. It turns out that if you do that, and you never weed for over two years, lots of weeds grow into the wood chips and form their own sort of soil. 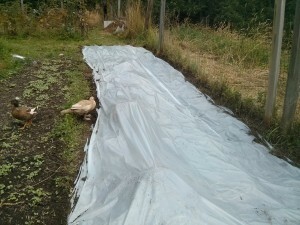 We were pleasantly surprised to find that we could simply peel this layer back, along with the 5 – 6″ thick mat of wood chips, weeds and soil on top of it. Underneath was soil that was in better shape than the stuff that was in the previously planted beds! I sadly forgot to take a photo after we pulled up all of the weed block. We had a heap of the weed/wood/soil mixture and a swath about three feet wide and over twenty feet long that had lots of mole tunnels, some established thistle roots, and little else going on. This plastic should cook the weeds under it. Today we dug a shallow trench around a 25′ x 8′ area that included our newly bare section, and covered it with 3.5mil plastic from the hardware store. we buried the edges all the way around, and by the time I finished (Ethan helped get me started and then moved on to something less grueling than digging in 90 degree heat), the plastic already had a good layer of condensation on it, and it felt at least 10 degrees hotter under the plastic than above it. I’m hopeful that in a couple of weeks we can remove the plastic and simply till in all of the thoroughly dead weeds and wood chips and that bed will be ready for sowing a week or two after that!